Seth and Elise, who both attended Pepperdine University and now live in Los Angeles, met while attending a Sorority/Fraternity bowling mixer. 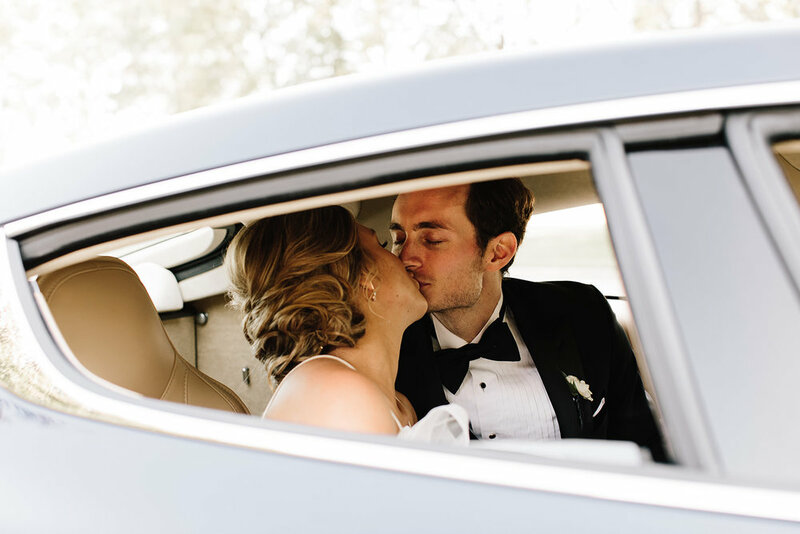 The didn’t talk much afterward until Elise needed Seth’s assistance with finding a location for a sorority philanthropic event. Once the event was over, Seth invited Elise for Taco Tuesday and things literally “took off” from there! 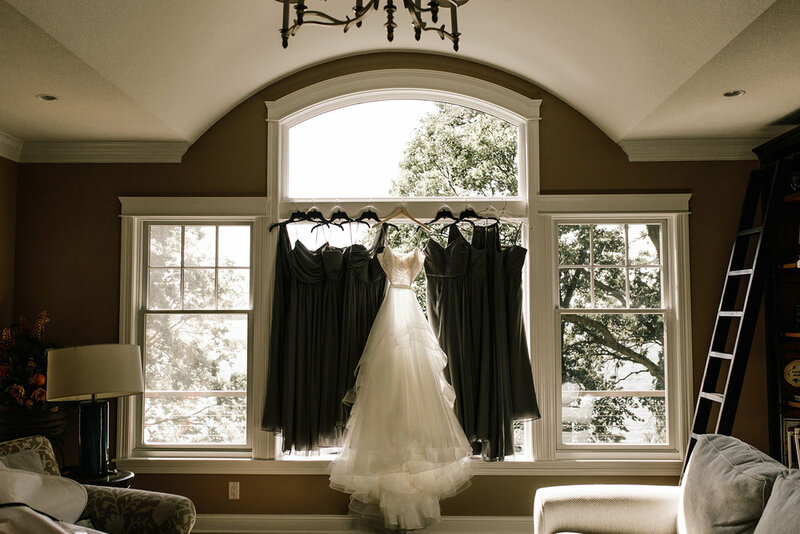 Their beautiful summer wedding took place in Willmar, Minnesota, Elise’s hometown. 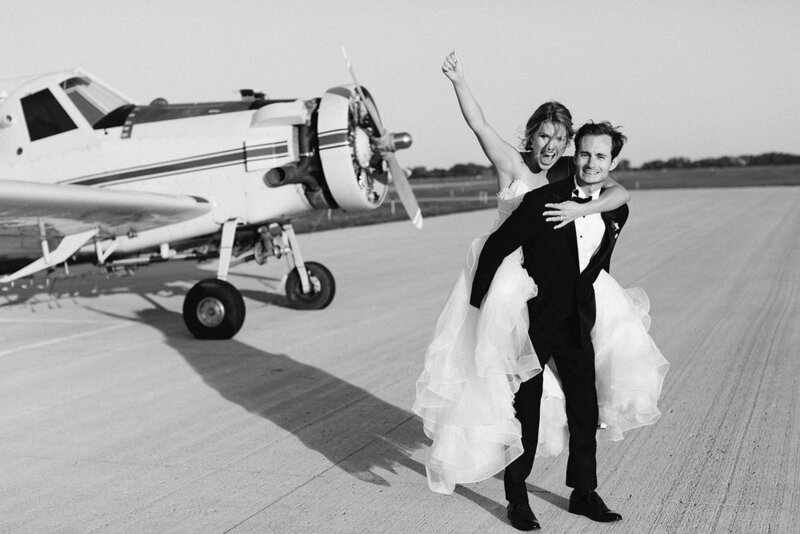 Following the church ceremony, guests proceeded to the family’s private airplane hangar for cocktails on the concrete apron of the hangar. For the grand reveal, the 90’ hangar door was slowly raised as guests peered inside. We beautifully transformed the metal fabricated walls, beams and concrete floor into an industrial modern, inviting space for guests. We mixed black farm tables with whitewashed chairs and black chairs with blue/gray linens. 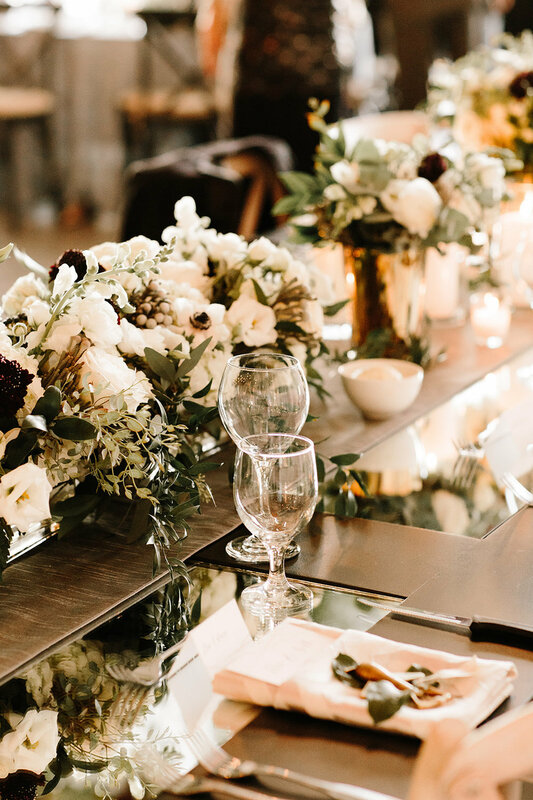 Modern geometric napkins added a modern touch and white florals popped with anemones and their gorgeous black centers added softness to the look. 150 feet of greenery and edison lights over the dance floor created an intimate space for dancing the night away to the incredible band, Northstar. Soft drapes separated work spaces for vendors and caterers and provided separation behind the head table for gorgeous blue velvet lounge groupings for guests to sit and visit. Airplane bottle openers and wines stoppers added the perfect favor to each place setting but the most incredible nod to the location was the sparkler send-off with the couple running through hundreds of guests to the awaiting plane which whisked the couple off to loud cheers! I have to say in all my years, it was the most exhilarating send-off I’ve ever experienced! What a thrill it was to plan something so different and to work with such a warm and genuine family. 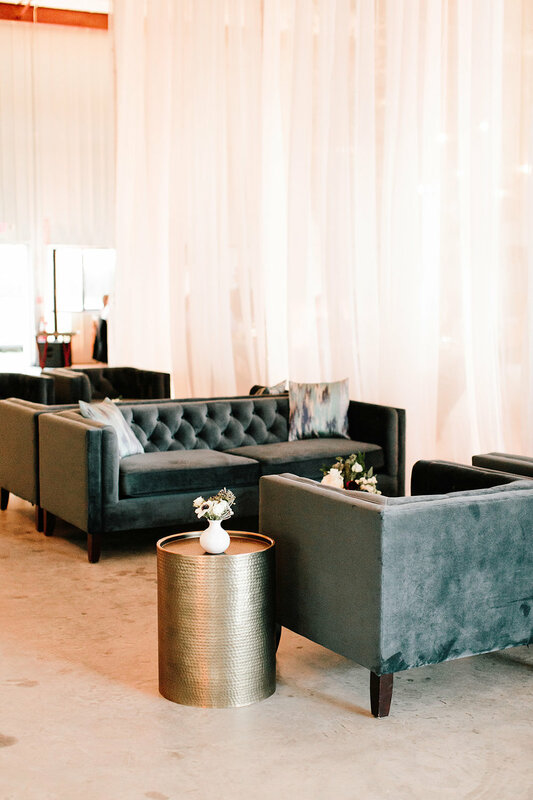 A modern twist on an industrial space made for one beautiful wedding. Check out how the day unfolded below!